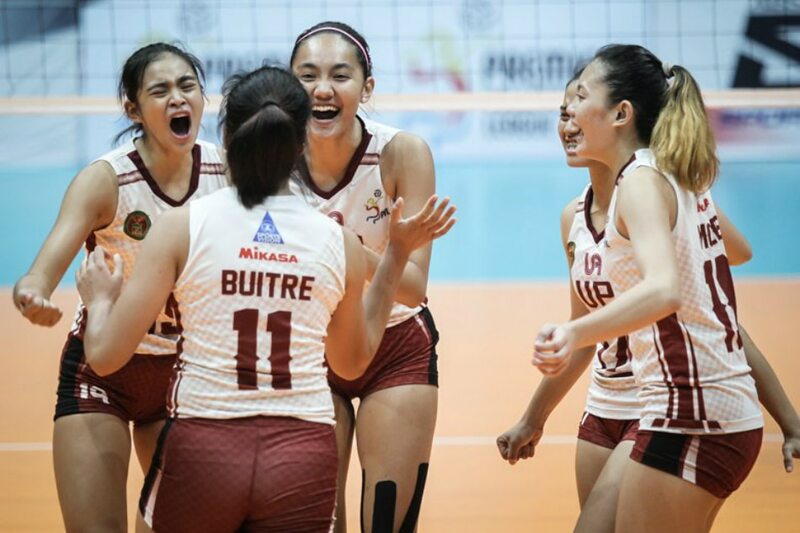 MANILA — (UPDATED) Championship newbie University of the Philippines (UP) Lady Maroons showed the kind of composure and grit of a seasoned team. The Lady Maroons shocked a more experienced Far Eastern University (FEU) in a come-from-behind 14-25, 22-25, 26-24, 25-18, 15-5 win Sunday to draw first blood in the best-of-three Premier Volleyball League (PVL) Season 2 Collegiate Conference finals series at the FilOil Flying V Centre in San Juan. UP, which is on its first major tournament championship stint in decades, can close the series in Game 2 on Wednesday. “That was very, very close. Again I just told them that we needed two things. One the pass, and, second less pressure on ourselves,” said UP coach Godfrey Okumu, who is looking to steer the Lady Maroons to their first major title since ruling the UAAP in 1982. “That’s what made the big change and then also I talked to Ayel (Estranero) and I was able to tell her to play smart. As you can see we started running, by running you were able to split the blocks. It was a little too late but at least it gave us the three sets,” added the Kenyan mentor. Isa Molde finished with 16 points while sophomore Roselyn Rosier played like a veteran with 15 markers highlighted by 13 attacks and added 14 digs for the Lady Maroons. Marian Buitre hammered 13 of her 14 points on attacks, while Aie Gannaban scored 11 for UP. The Lady Maroons turned the tables around with a huge third and fourth set win. With momentum on their side, UP put chills on the UAAP Season 80 runner-up by racing to an 8-3 lead and never looked back. FEU lost an important piece at the middle in Celine Domingo early in the fifth set to a right knee injury and the Diliman-based squad capitalized. Heather Guino-o posted 17 points off 11 attacks and six aces while Domingo chipped in nine kills, four aces and three kill blocks for 16 markers for the Lady Tams, who gave away 35 points off errors. Rookie Lycha Ebon logged in 14 points while Jerrili Malabanan had 12 for FEU, which finished second last year behind National University. Warning from history: Could Japan-style crash hit China?